Rated 5 out of 5 by Blackie110 from WOW....Another Great Game I bought this game after playing the demo for 10 minutes. Absolutely loved this game. Everything you could ask for. Rated 5 out of 5 by Gumka from Epic journey through your mind! I love the game! We have thrilling story, plot twists, cool minigames and challenging villians. So many different characters which are more surprising than you can imagine! I really liked our main hero - Alice, who hasn't the same problem as her? Rated 5 out of 5 by BFFirefly from Fun HOPA Game! Game play has been excellently reviewed by previous posters, so will not waste time. Review of demo. I wasn't sure I would like it at first but it picked up and was great fun with a nice creep factor. Cut scenes are excellently done, as are the voice overs. A strategy guide or walk-through isn't needed in this SE, as an interactive jump map will always keep you on the right path. Puzzles weren't overly difficult but fun. A journal will help you keep track of notes that hold clues and a list of tasks you need to perform. The game is mostly linear. If you need to backtrack, it won't be far. I found this to be a fun game. Try the demo and see for yourself but it's a definite purchase for me. Thanks developers for a great game! Rated 5 out of 5 by rosekaufmann from FUN to PLAY AND FOLLOW THE PATH TO NEW BEGINNINGS Follow Alice as she goes down a different path from a job and boss she hates to her own successful business. Bright and cheery graphics; a "mind" monster who will put her on the right path (he seems sinister but this is going back in her mind to the events that turned her life around); and nicely-developed story. HOS are well-done (but items may occasionally be difficult to find). Puzzles are fairly easy for advanced players. Many more puzzles than HOS. Artwork is stylistic, which I personally like, but it may put others off if you're looking for an entire game with "real" characters and objects. A good production value and fun to play. Rated 5 out of 5 by nyloracyevrah from Alice's Boss Blows Her Mind! After experiencing the opening scene, I had to step out for a moment and check to see if this game was a CE! The high quality visuals and voice acting caught my attention straight away and as the unique story line unfolded, I was hooked! Boy, I thought my boss was bad! (just joking, Boss, if you are reading this) The HO scenes are well done and not too difficult, with some tasks to complete and items to use together to reveal all objects. Some of the animation is really put together nicely! The puzzles are mostly the usual fare with lights to connect and matching characters, though still a bit tricky to complete. Some take quite a bit of thought. Other reviewers have talked about the plot and did so with great finesse, so I won't bother to rehash, except to say, this is something new, fresh, innovative, and definitely an exciting adventure! I just purchased Mind Snares: Alice's Journey and it has finished downloading. I have already received some nice Achievements, but I think I will start again with a new profile so as not to miss a single thing! Try the Demo folks. This SE will certainly surprise you! Rated 5 out of 5 by hibc60 from based on the demo this was a buy for me I don't buy games from just the demo to often but this one just hit the spot. interesting story line, great hint button and a map. I want to keep playing and find out what happens so this was a buy for me. don't use sound so can't rate that but game is great. Rated 5 out of 5 by farmguys from Mind Snares Alice's Journey This is a great game. Chilling story line and great graphics. I usually buy Collector's Editions but this one really got my attention during the free trial. Rated 5 out of 5 by 1955raven from EXCELLENT JOURNEY!!! VERY INTERESTING,FUN GAME,WILL BUY!!! Rated 5 out of 5 by Nilosh from Brilliant Story, Fascinating Game I am totally in agreement with JustTheFact, this really is a spectacular game. Yes it is cartoonish, yes the first scenes are familiar; like we haven't had a car accident and woken up in an empty sanatorium or hospital? The story however is really fascinating, a theme most of us can relate too. Conquering one's fear and realizing what a paralyzing effect it has on our lives, inhibiting our actions and keeping us lock in our own prison filled with regrets and discontentment. In Mind Snares, we join Alice in her quest to fight the demon that has her trapped in her own mind which is manifested in an abandoned hospital. Her adventure begins in this classic HOPA game that takes me back to the days when you had to use a bit of your brain cells to decipher puzzles, collect inventory items and solve mini-games without the help of a strategy guide or a pet or a companion. I realized after having played the first hour of the demo that I really do miss the classics. Although visuals are somewhat dated, don’t let the cartoon graphics fool you. The voice-overs are very well acted and background music adds to the intensity of the game. There is enough tension that does build up and enhances the fear factor and makes the game even more interesting. By the end of the demo, I was totally engrossed with Alice and her quest to find the Totems that represent the hindrances in her life and when completed, will return her back to her reality a changed woman. There are three game modes to choose from and Expert mode offers penalty clicks as well. There is a diary that holds your clues and outlines objectives and a map that does indicate areas of interest and allows for travel. At first glance the game appears to be easy, but the challenge lies in the fact that there really isn’t too much hand holding. Although not too strenuous, you do need on occasion to use the little grey cells to decipher where use your inventory item which is what do prefer. 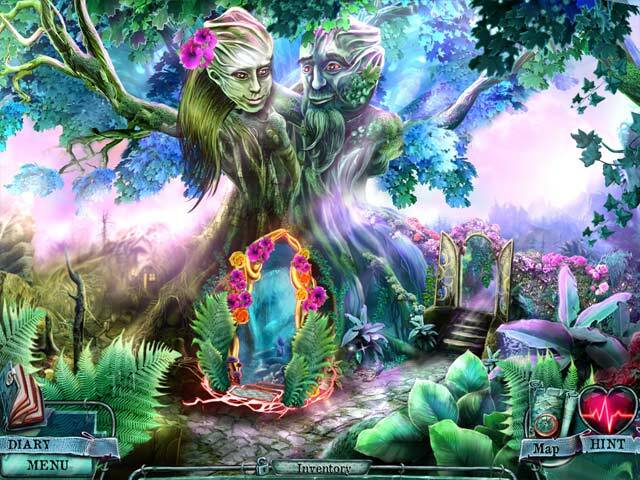 The hidden object games are standard, junk-piled with slight interaction, classic and easy to do. I also came across finding silhouettes of items shown. I enjoyed the mini-games, very well conceptualized and some even require a bit more time and effort to solve. There are no Blings in this game but there is a list of achievements to earn which does make for some challenge. Game play is pretty straightforward, driven by a very interesting and thought provoking storyline. I applaud the developers for taking us back to the good old days when HOPA games were interesting and fun to play. A winner in standard game category and a must have on my list. I really think the story is interesting and may no doubt shed some light in our own personal journey in the need to conquer our own fears. Rated 5 out of 5 by JustTheFacts from Wow! Fantastic! BASED ON DEMO FIRST IMPRESSIONS One of the best stand alone SEs I have ever played, this game opens with a casual confidence, twists into mounting tension, builds on into creepy, suddenly becoming downright scary, and then that darn sinister laugh - nearly gave me goose bumps. You just don’t see many intros which are that wide-ranging in emotions. And everything about the game is just a little bit different. SIGHTS & SOUNDS The graphics are easily CE standard. The cut scenes are extremely well done, the HOP scenes are clear, detailed, and with just the lightest of surreal touches making them interesting. Lots of life and light, but with that colour palette that always lets me know this is a game that will have its gross moments. You know, the purples and greens, and oranges with pinks. Liked the interface, too. All that dangerous broken glass! The main character/narrator’s voiceover is excellent. She acts very well, with the right emphasis and intonation, as well as clear and flawless pronunciation. The other characters achieve a close approximation to lip synch. The music is multi-layered, often ominous, but also exciting & energetic at times. Great ambient sounds and effects. WHAT’S HAPPENING? This is a good somewhat original story, well structured, but little emphasis is really given it in the game. You used to be trapped in a dead end job with an over-demanding boss, but without the fortitude to get out. Then something terrible goes horribly wrong. An evil laugh follows you down into darkness, and you wake up trapped in a hospital room. But the story does not descend into another of the ‘abandoned asylum’ games, it is way more weird than that! Alice’s journey is an internal mental one, as most of you have probably already guessed, and so anything is possible. We find ourselves on a quest to find 4 totems, each from a different world, in order to escape back to reality. GAMEPLAY The adventure gameplay is fairly easy, and so too are the many HOPs and mini-games. There are, wait for it, 30 (!!) HOPs, but don’t panic, because there are 40(!!) mini-games. At least, it seems so according to the achievements list. Yes, there are also (many) achievements! No collectibles however. Again, some at least of the HOPs you can expect to be quirky, for example the one of Vitrupian Woman (hee hee), where all the items on the word list are silhouettes on a poster. So far the mini-games are easy and fun. The journal gives objectives and sub-objectives, as well as notes. Hint is directional, and you will eventually get an interactive jump map, which indicates task available, if you choose. There are choices of 3 levels of difficulty, volumes, widescreen, and aspect correction. COMBINED IMPACT It took me almost exactly the full hour to complete the demo, which was still in the first of 4 chapters, and a reasonably long way till its completion. These developers have spent their money wisely. There are only a few but very effective cut-scenes, which you can’t play later, and carefully distributed excellent voiceover, rather than endless chat. It just doesn’t have the glamour of many games. But it has good solid gameplay, attractive and interesting artwork, and a little quirkiness as a bonus. In all, a great SE game. If this is the quality of games we can expect for our PCCs in the future, I for one am happy to accommodate the recent changes! Rated 4 out of 5 by hermitcave from You want to make changes in your life but Fate has other plans. Injured in a crash, you struggle to gain control and start a new life Two years ago, Alice Dahl fulfilled her dream of starting her own business, a bookstore cafe, that became successful and was happy when she was contacted for an interview by a news agency about becoming a business entrepreneur of the year. During the interview, she related to the reporter that things had not always been this way. She used to work for a manager in an office who constantly gave her personal errands to do for him on top of her regular work and was required to work any time he decided that something needed to be done. She was afraid to stand up to him for fear of losing her job. She was about to leave on vacation when he sent her on business to Seattle that canceled her vacation. While driving in a rain storm across a bridge, the wheel suddenly turned causing the car to crash and fall into the water. As if in a dream, she saw an ominous cloaked figure controlling a puppet figure of herself and commenting that he had plans for her. As she became aware of her surroundings and not sure if she was dreaming, she finds her legs strapped to a gurney in a hospital-like room. From her hand, a red lifeline begins to move around the room as if showing her a direction she should travel. Releasing the straps, she follows the red line as if there was some spiritual connection with it and she feels someone is watching her. As she explores, she finds objects from her past and an exit door which she is finally able to open. As she trys to exit, everything around her begins to fall apart leaving her in a dark area with several new doors. Only able to open one of the doors, she finds a swivelled old woman who seems to know her and tells her she needs to defeat her demons to find her way out and back home. She needs to find four totems that will restore the path to the the way back to her life. They are scattered in four remote parts of her memory and each area can be accessed by a portal that opens to each of the four areas that she will need to explore to find the totems. The title page shows a puppet Alice struggling to break free from her controlling wires which suggests a struggle between her desire to make changes to her life and fate who has plans for her. She has to fight her way back to consciousness by fighting against that feeling of helplessness and being afraid to try something new. The graphics depicted a hazy central core of the mind with multiple paths that led to four distinct areas that she had to explore to obtain the totems. Each of those areas were well presented fitting their themes. Music varied with locations and voice acting was good. There is a jump map provided for the first three areas visited but not in the fourth. Inventory puzzles and minigames were the usual seen in these games and presented nothing really new. 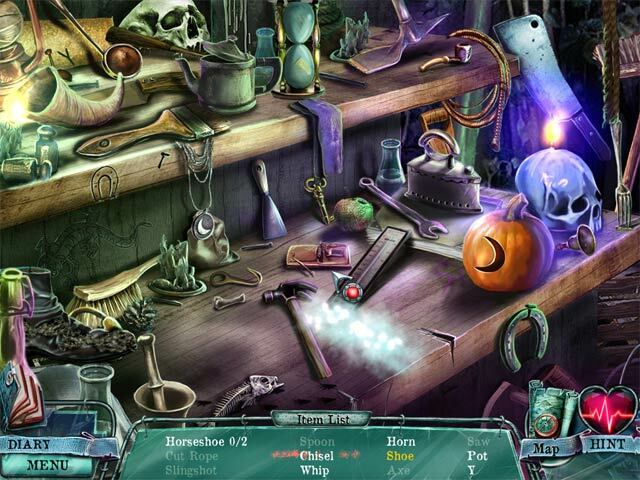 Hidden object scenes were the usual interactive list type with most objects fairly easy to find. There is a journal for the story and clues with an objectives tab. This one doesn't set any new trends but will provide a few hours of diversion. Rated 4 out of 5 by BooksandGameFan from Really fun game! Confront your fears, that’s the message in Alice's Journey. A mix of hidden object and point and click adventure. Alice, has to confront her fears in the real world by solving issues in an alternate universe. It starts off well, with the background to Alice’s predicament. She hates her job and wants to make a change but is scared to do anything about it. In a ‘Life on Mars’ style twist, she has an accident on the way to meet a client and finds herself in a shadowy dimension where her fears are realized and she must solve them by completing puzzles. The hand drawn backgrounds are impressive and there's plenty of detail to take in as you tour the strange land and try to find your way back to the real world. This and the interesting story will keep fans of the genre happy, though I found the ending was far too abrupt and it felt as if it had been cut short for some reason. That is the only reason it got 4 stars instead of 5. I highly recommend the game! Rated 4 out of 5 by tutortime from No complaints - got it free. I think this is an older game. It seemed rather short in length and it was not much of a challenge. Rated 4 out of 5 by krystal59 from nice surprize! Wow this was a good little game. A SE with achievements. Good graphics, use of color and plenty of locations to explore. It does follow a pretty standard theme of a car crash and then entering different worlds through portals to find "Totems". You then return and place the totem to open the next portal. Hopefully this will allow you to find your way back and change your life. This one was a bit HO heavy but that for me was a good thing. There were plenty of mini games also, that were not overly difficult but fun to complete. All in all I quite liked this one. Had they added collectibles you would not have known it was only a SE. It was a pretty high quality production with good VO's, a nice mix of adventure play, mini games and HO scenes and several different worlds to explore. Best part for me was that no one went missing or was kidnapped. I just can't do that storyline another time. This one was good fun and I liked it. Rated 4 out of 5 by poppyjmh from mind snares: alice's journey A really good game,an interactive map which is always a must have, game could of been longer though. Rated 4 out of 5 by Mazeo from One of the better ones I liked this game. It kept my interest and I thought the puzzles were quite good. 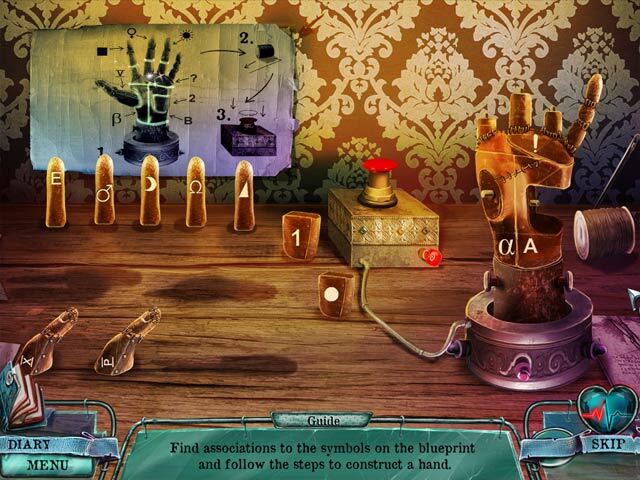 The hidden objects were not overly difficult but that was OK with me. If I had a criticism I'd say that the last chapter was pretty short, and pretty easy, and I found the ending itself to be a bit "odd," ..... kinda like leaving it a bit up in the air so as to make way for a sequel maybe?? Also the music was a bit annoying .... but overall I'd recommend this game. 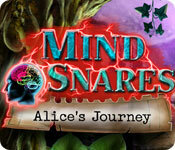 Rated 4 out of 5 by rjohn82677 from Mind Snares: Alice's Journey I really enjoyed this game. It is incredible that the "non Collector's Edition" games that I have bought with my free game credits are been so much better. While the story line is unusual, the game play is delightful, The story line is "dark" but it does make you think about your life and what is important. Rated 4 out of 5 by spenny1 from Unfinished version This is a great game with a good level of challenge and a good balance of puzzles and HOS. It's such a shame that we have only been offered the SE version, as the ending is non existent. Such a disappointment. Rated 4 out of 5 by lmilonas from Great game Enjoyed playing this game. Fun for hours. Rated 4 out of 5 by animefan18 from Mind Snares: Alice's Journey This game is addictive and intriguing. I give it 7 out of 10; a brilliant use of symbolism. Rated 4 out of 5 by csmith116 from Over so soon? First, let me say this is a buy. I was intrigued with the story which was different than so many others. It took me hours and hours to advance to the next level but once I did the additional levels (there are 4) I completed each one in less than 15 to 30 minutes each. Rated 4 out of 5 by charlene_lane from JOURNEY TO THE CENTER OF YOUR MIND Wow, this is literally 'mind blowing'. Absolutely brilliant game. You have: * Casual, Advanced and Expert modes of play; * Voiceovers; * Diary; * Interactive map; * Achievements Board [18 of them]. Even though its not a collectors edition, we have all the benefits of one. Well done. The graphics are very vivid but still clear to see everything. The sound is very good. There are four chapters to this tale and each time you get a different piece of music. The HOS are easy to medium. There are plenty of them but not every step you take and they don't take too long to do. Everything was clear and not too junk piled. The mini-games were fun and I'm sure you will find your favourite ones in there. I enjoyed them all. Overall I really enjoyed playing this game and definitely recommend it for everyone. Well worth buying to add to your collection. Rated 4 out of 5 by AWhitehead from Excellent game, good moral! Beautiful artwork, good animation and voice acting. I especially loved the message that you can change your life for the better. Drawbacks were that the story just end abruptly with no epilogue and that in the area with the hag, the English text at the top reflected bad grammar and spelling. I understand that the production team for the game may not be native English speakers, but most of the other text in the game is good. Editing is important!